A delightful version of the classic game appealing equally to children and adults. The two players take turns to drop a bead onto a pole, trying to create a row of four beads in their own colour, either horizontally, vertically, or diagonally. First the six poles must be pushed firmly down into the pre-drilled holes in the base which is placed between the players. The players each take a set of 18 beads (coloured or plain) and put them into the hollowed out "trays" in the base on their side of the row of poles. Having decided who will start, each player alternately drops one of his or her beads onto a pole. 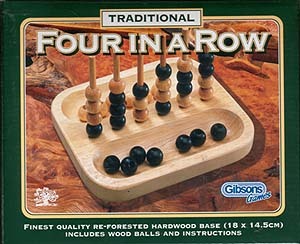 As the stack of beads rise up the poles the possibilities of creating a row of four in a colour increase for both players, and a mistake in placing a bead by one player can bring instant success to the other. Should all the beads be played without either player achieving a winning line, the result is a draw.